Your divorce may result in the court ordering two types of support payments – child support and/or alimony. One way to ensure court-ordered is paid in full is to request the payor (the person ordered to pay support) to maintain a life insurance policy. 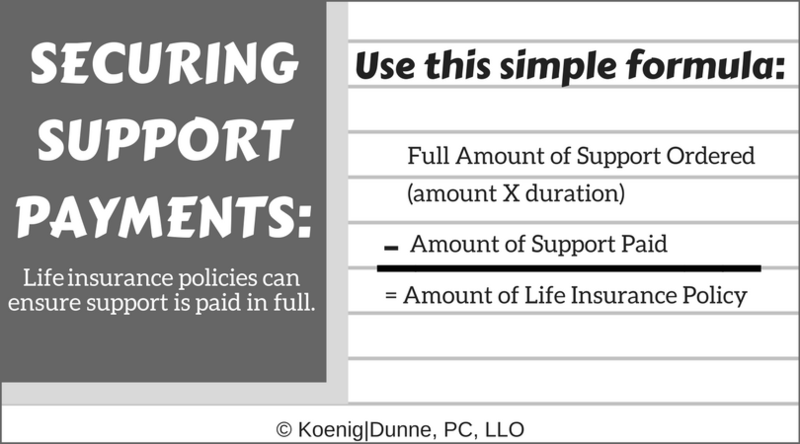 The recipient should be named the beneficiary of the policy and the amount of the policy should be sufficient to satisfy the full amount of support ordered in the event the payor dies. Alimony: If alimony is awarded in your case, you will know the monthly amount that will be paid and for how long it will be paid. Child Support: Child support orders generally terminate when the child reaches the age of majority (19 in Nebraska), marries, dies, emancipates, or by order of the Court, whichever happens first. You will want to be explicit in your decree that the recipient has access to ensure the payor is complying with the life insurance provision. If you are the recipient, you may also ask the carrier(s) to notify you if the payor cancels any policy being used to fund court-ordered support payments. Another option is called a conditional money judgment. If the payor dies before paying the full amount of support due, the recipient should be entitled to a conditional money judgment against the payor’s estate. The formula for determining the amount owed is the same as for the life insurance policy. The estate should pay the difference between the full amount of support ordered less the support already paid. Other types of security may be ordered by the court so long as they’re “reasonable.” Regardless of whether you’re the payor or the recipient, talk with your Koenig│Dunne family law attorneys to decide the best way to protect your interests in this regard.